So Mayor Bloomberg: where is the Peopleâ€™s Library? I’ve been waiting a few days to post anything. There have been conflicting reports on what happened to the Occupy Wall Street People’s Library when Zuccotti Park was raided and people in the Occupy Wall Street occupation were removed, sometimes forcibly. 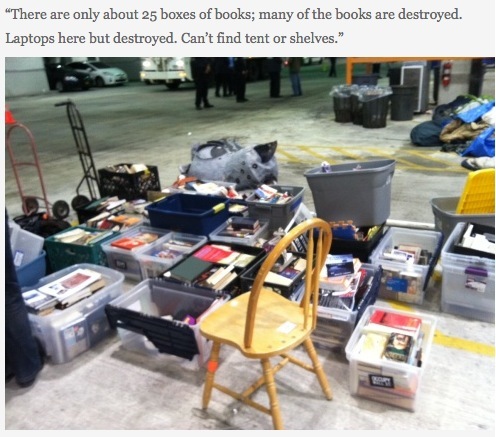 There were reports that the 5000+ books from the OWS Library had been tossed in a dumpster. Then there were reports that the materials were removed but not disposed of. The feeling that I got was that your impression of what happened to the stuff was shaped largely by which side of the project you sympathized with the most, but I was holding out hope that the OWS People’s Library materials would be found safe, even if I didn’t personally believe that would be the case. Today I have been reading the official reports from the people who had been working in the library and it seems that while some of their stuff is okay, much of it has been destroyed or missing. This is the current post that is being updated about the state of their stuff and the state of the people who were arrested inside the library [as of now, one appears to be out, one is still being held]. If you’re in the area, they’d appreciate some help sorting through things and especially transporting them. update: very good overview about yesterday’s activities by Rachel Maddow. Nice shoutout to LibraryThing! I’m glad that at least the material of the library is safe and not lost. Good luck and hopefully this crisis will pass and everything is fixed.